Bajra, or pearl millet, is the most commonly grown millets and is mostly cultivated in India and Africa. It is an excellent grain to have in your pantry with its numerous health benefits. It is known to lower cholesterol, aid digestion and also prevent asthma in many cases. It can be consumed whole or by grinding it finely and consuming it as bajra flour. As a whole it can replace rice in many recipes and is also a much better alternative to eat. Bajra is a replacement of rice when you want to make your dishes much healthy. A wholesome khichdi is not only filling but also warms your heart and is better for your health. To make khichdi with bajra, it first needs to be soaked overnight to hasten the cooking process. Soaking results in softening of the grain which in turn makes the cooking process much faster. There are many variations of khichdi that can be made with bajra like the ones mentioned below. Not only that, you can even experiment with different vegetables and dals along with it, to make it taste even better! Bajra makes for an excellent ingredient to make snacks with. Apart from the nutrition it provides, it also gives a nutty undertone to the food. 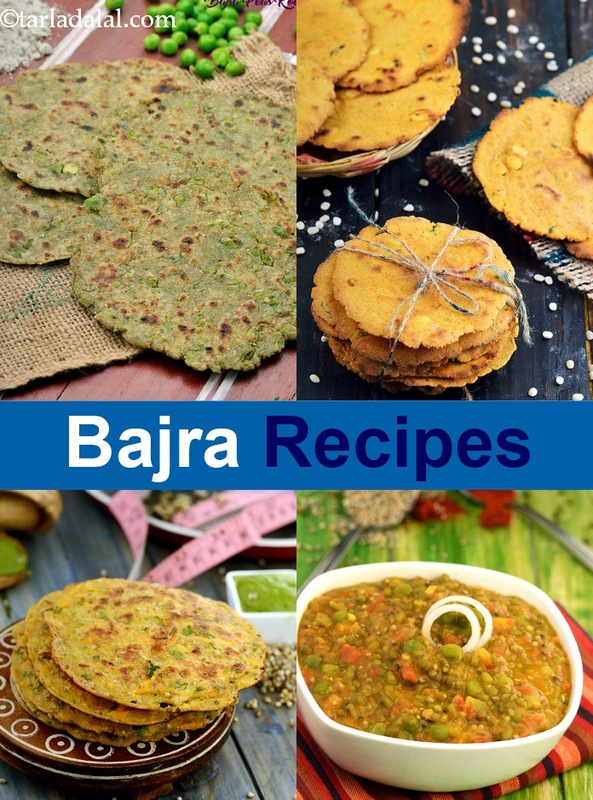 Bajra flour is used extensively to make healthy khakhras which can be perked up with methi, jeera and much more! Apart from these, there are a variety of snacks made with bajra from the delectable and finger licking muthias to the perfectly crispy, deep fried tea time snack – Dhebras. If you're looking for something innovative, you can even make a multigrain bread with it! The most common use of Bajra flour, especially in India is to use it for various kinds of rotis and parathas. Not only does it taste good alone, but it also tastes amazing with different types of flours! Multigrain Roti or Thalipeeth are such items that can be made regularly in our homes to be had along with a spicy thecha or a mixed vegetable subzi. It is also a staple in Gujarati households as Rotla, a thick Indian flatbread, is made regularly with bajra flour.